‘Value-chains’ are interactive, collaborative systems that create and deliver products valued by consumers. The flow of products, money and information in value-chains is highly dependent upon the relationships among members. As all businesses belong to chains that deliver products, services or information, this manual is relevant if you need to better understand how some of the chains in which your business is involved can be improved for the benefit of all members. 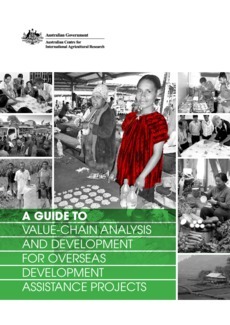 This manual promotes ‘value-chain thinking’, which means taking a whole-of-chain perspective, emphasising the importance of understanding markets and consumers, and collaboration among chain members. It highlights how effective partners can align their skills, resources and behaviour to deliver products and services to receptive consumers and to reduce waste, with the resultant financial returns being distributed equitably so as to sustain the partnerships. It helps chain members to recognise their interdependence, and the consequent benefits of building collaborative relationships for solving the shared problems of creating and delivering consumer value. This interactive research and training manual translates value-chain theory into research practice, and incorporates practitioner experience back into theory, thereby improving research practice in a learning cycle (Senge and Scharmer 2001).